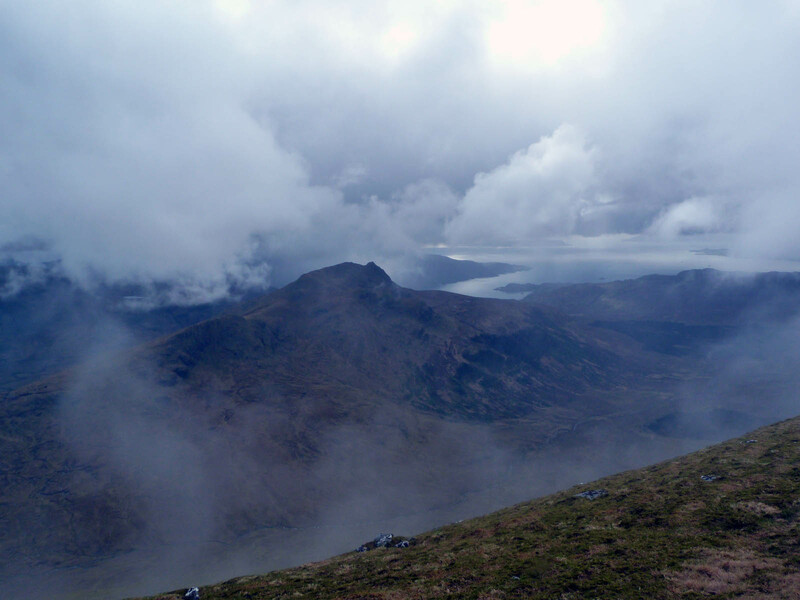 Day 5 - Ladhar Bheinn circular, 15½ miles, 5374ft ascent. Being out of the tent and in a very comfy bed didn't help me get much sleep last night - the curse of the bunkhouse / hostel kept me awake throughout - the snorer! Normally I wouldn't mention it and take it as par-for-the-course that you're likely to encounter a snorer, but this occurrence was something else! In fact in our room there were three snorers (all mates as it happens) and they came together like a evening chorus of randy toads. One snored 'normally' and consistently, another one chipped with occasional grunts but one of them - the one nearest me of course! - was making the most bizarre and loud noises I'd ever heard emanate from a human being. If you'd not witnessed it you and heard the sounds out of context you'd never guess they were coming out of a man. He sounded more like an angry asthmatic walrus choking on something, or the death throes of the most irate of cheap 70s Doctor Who monsters. My shock and bewilderment kept me awake as much as the sheer volume. I got up to sleep in the lounge, but it was raining and I suspected the noise of a drain outside the door would be just as bad. Just as well too as the lounge was shortly taken over by a rather boisterous stag night. (Stag nights in Inverie... whatever next!?) I returned to my bed, and with the pillow clasped around my head waited for dawn as patiently as I could. 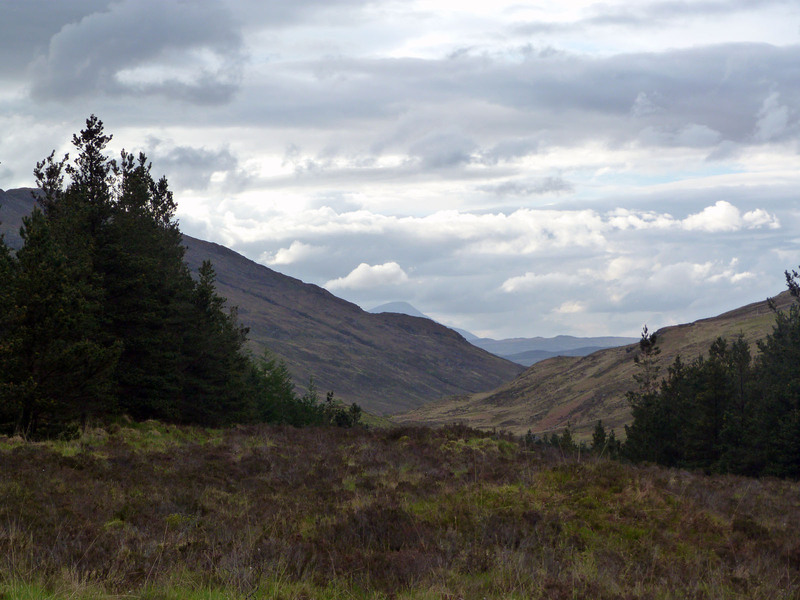 It was also during the restless night that the cost of marching through the bracken & heather in Glen Garry a couple of days with my trouser legs rolled up became apparent. A price paid in scratches, bites and ticks! Nice. But at least that meant I had no hope of an accidental lie-in, and therefore was away nice and early again at bang on 8am. 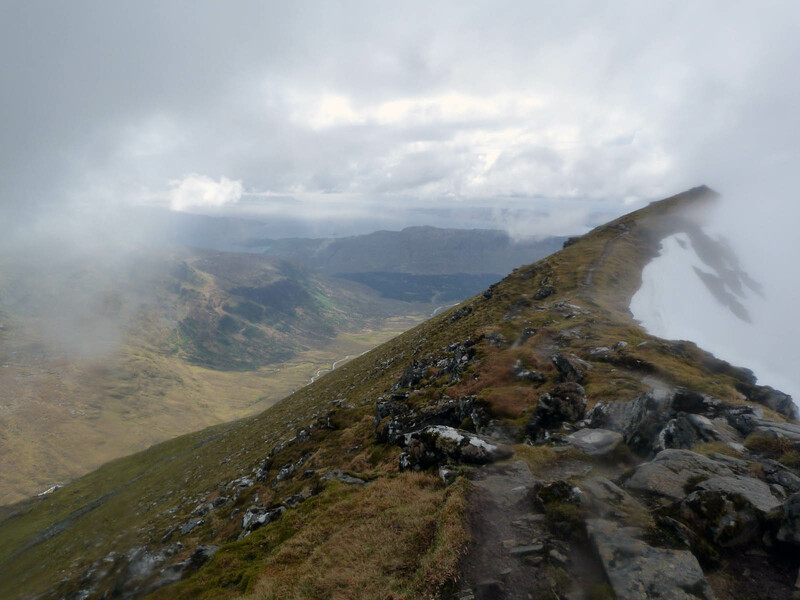 My plan was to leave the Barrisdale path at somewhere near the Brocket Memorial and head NE and upwards, hopefully ending up at Mám Suidheig and from there head along the ridge to Aonach Sgoilte. Well, that was the plan. Progress up the hill was very slow, as usual very lumpy with lots of water and hidden rivulets. 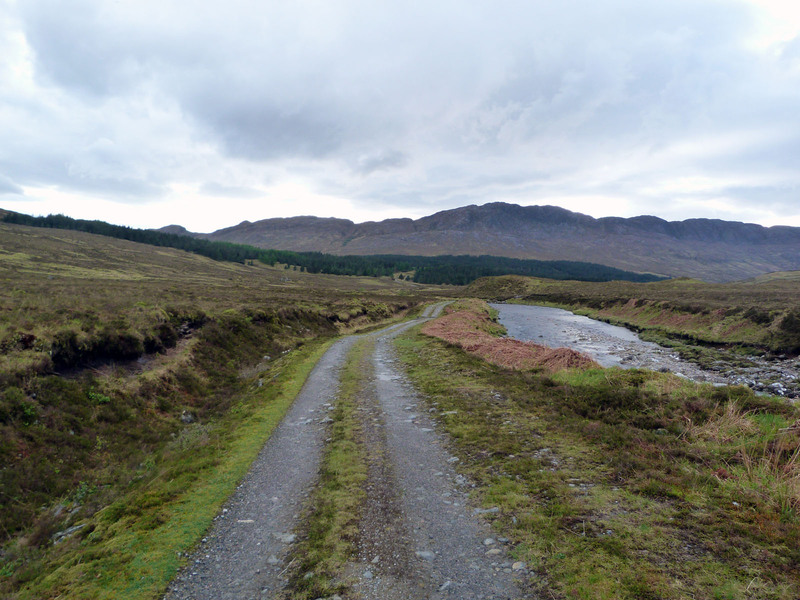 My compass-bearing route was also often blocked by creeks and rocky outcrops. And with the morning sun beating down on my back it was very hot. The memorial soon disappeared from view, but the loch seemed to getting no further away! 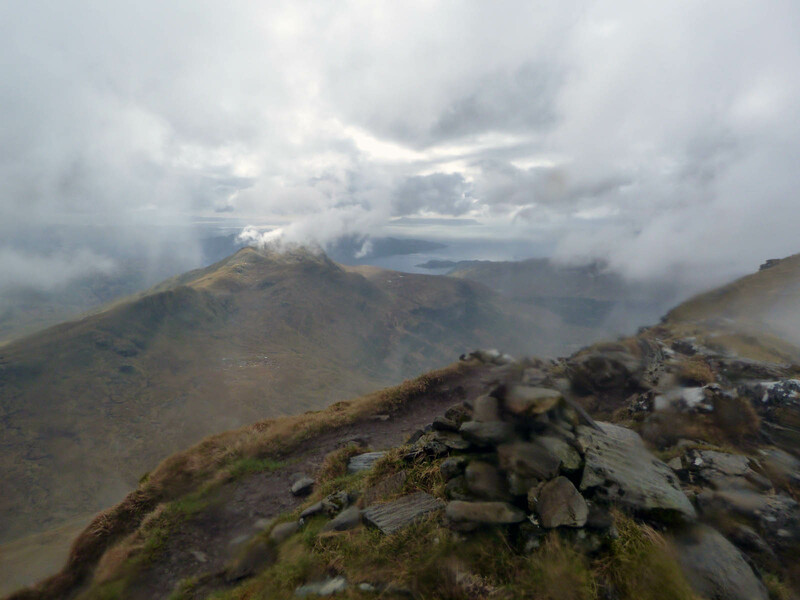 The photo above was taken some 2½ hours after setting off. Apart from from the train, this deer was one of only four that I saw. 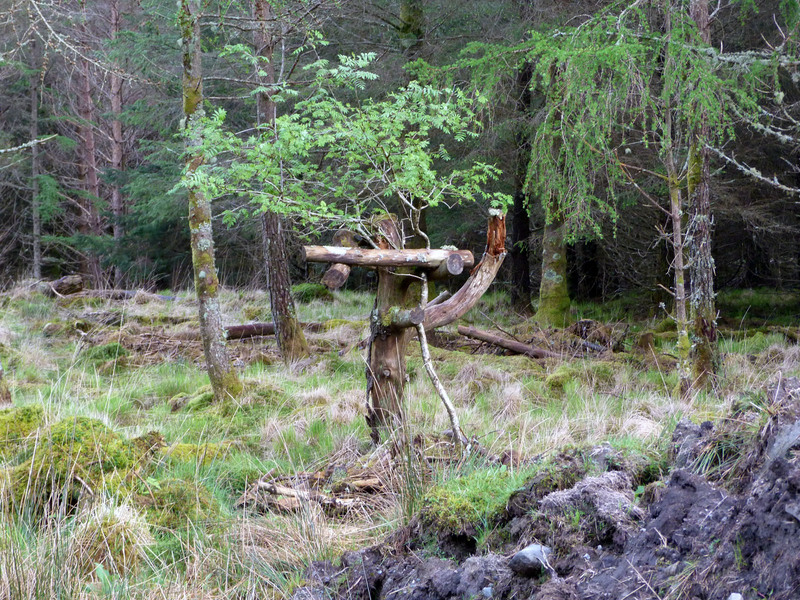 Its location was duly logged and passed onto the Knoydart Foundation. After losing my (reserve) hat and having to back-track to find it - good old GPS! - I realised that I'd been drifting NW rather than NE. So the temporary hat-loss was actually quite serendipitous as it forced me back on route. 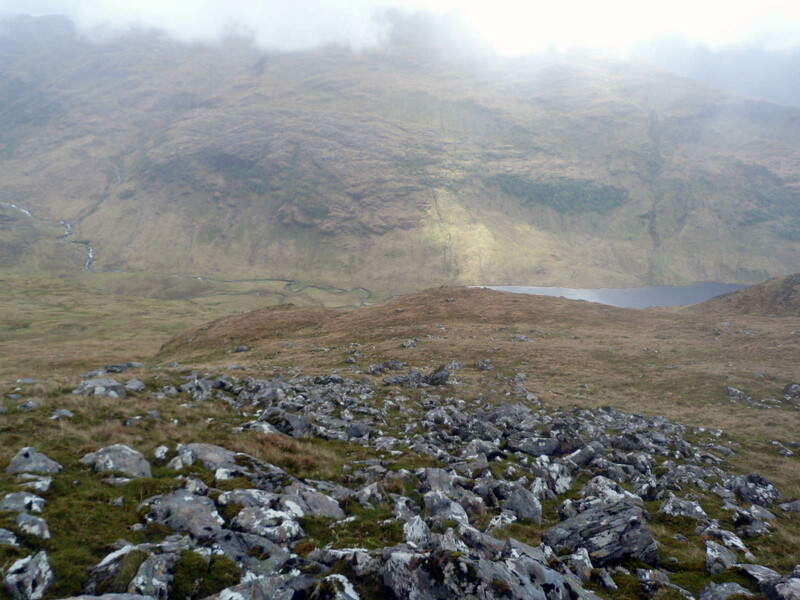 It was still a real slog getting up the hillside, although we'd got more than 1600ft up - nearly half way to the summit! (As the crows flies vertically). By now I'd also veered someway away from the route I'd planned, so was for the first time using the "off-route" feature in the GPS. Quite handy. 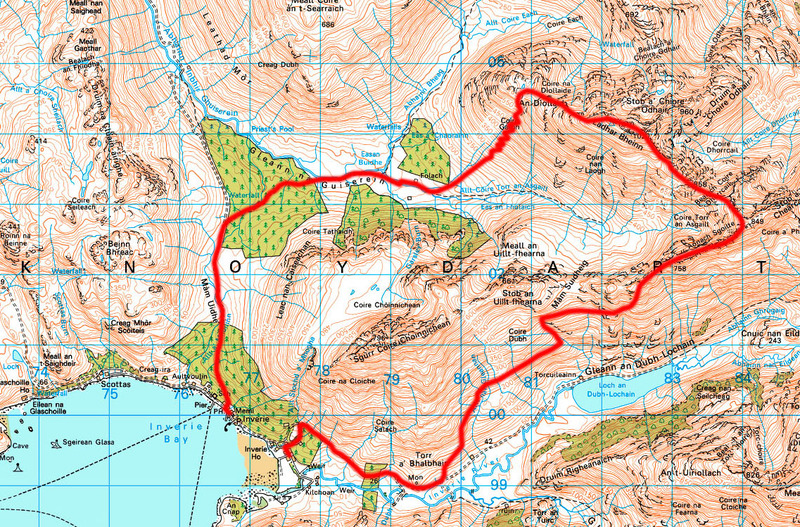 Some maps also show a path from futher up the Barrisdale path, but this misses out most of the ridge, but with hind-sight might have been a better option. 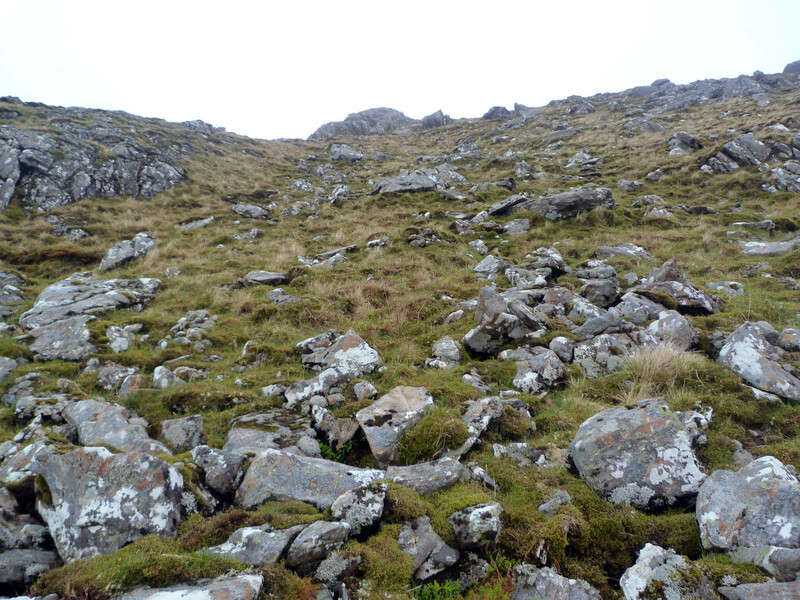 The rocky patch above was the last push to get to the ridge. So nearly four hours after setting up we were on the ridge. Some 2200ft up and perhaps just four or five miles horizontally from bed! 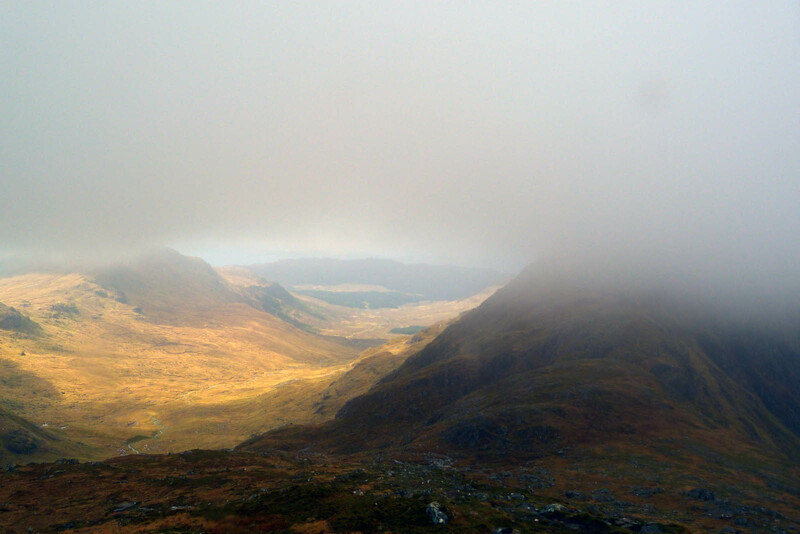 The sun had long gone, but views that the gaps in the mist afforded were fantastic. The mist and rain would continue to roll in and roll out for most of the day now. 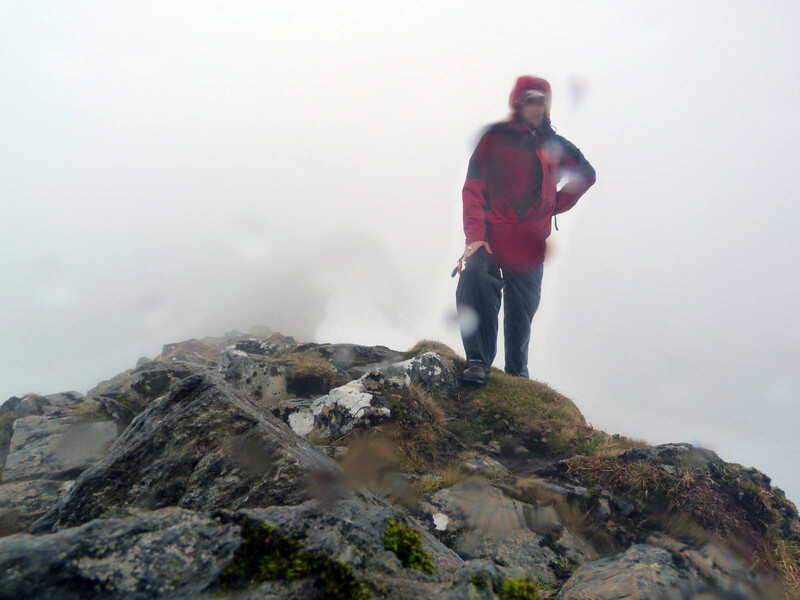 Heading along the ridge to the summit of Aonach Sgoilte I got myself into a bit of a pickle. 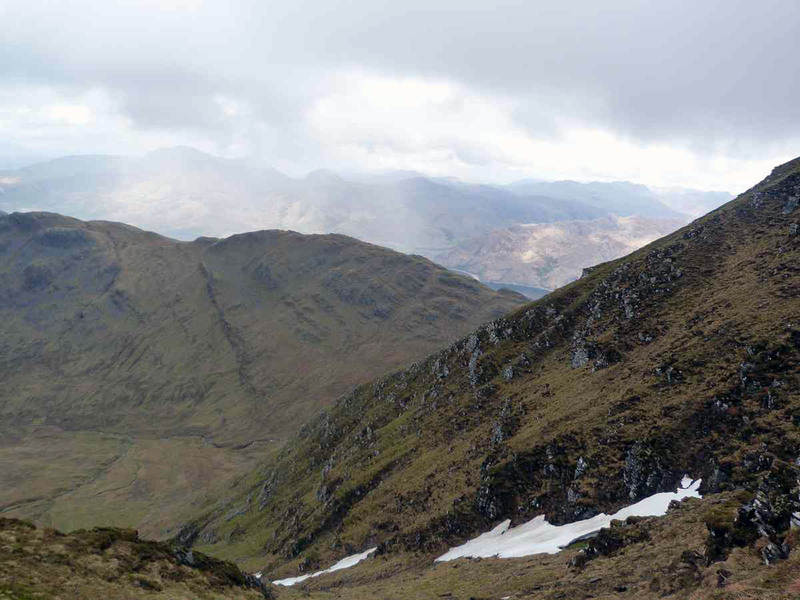 Walking through the gap between the two ridges in the above-left photo (for which there's a name but can't remember what it is now) a clear path lead up to the left to the top, which I obligingly and unthinkingly followed. 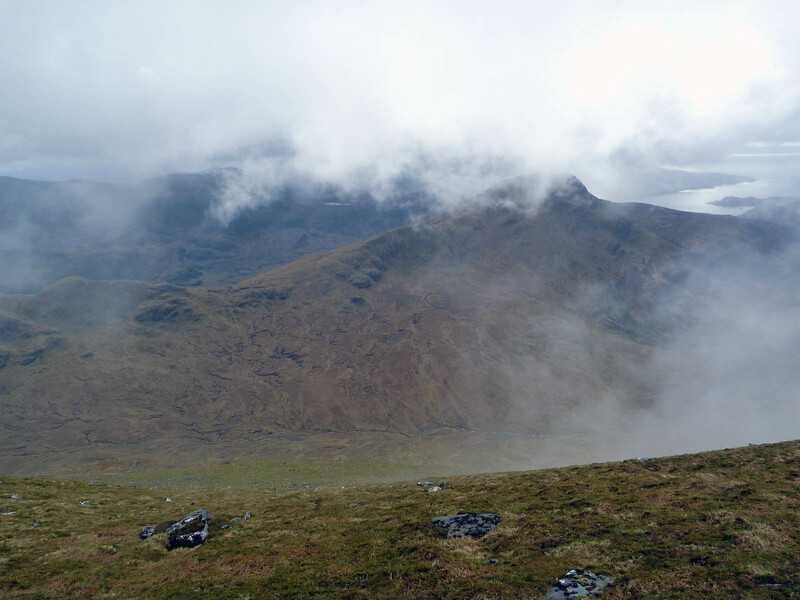 But when the end of that ridge came I found myself a bit stuck at the top with a pretty much vertical drop down to the path which I could clearly see at the bottom. My GPS said I was on the path, or as good as, but I just couldn't see how to get from where I was to where I was supposed to be next. 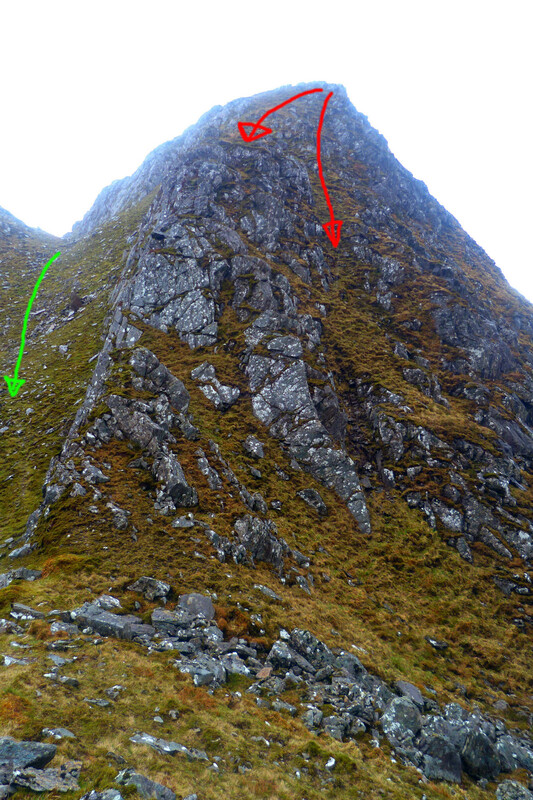 The above-right photo is looking back at the ridge from the far end, and the two red lines show my abortive attempts to clamber down before realising this couldn't possibly be right. 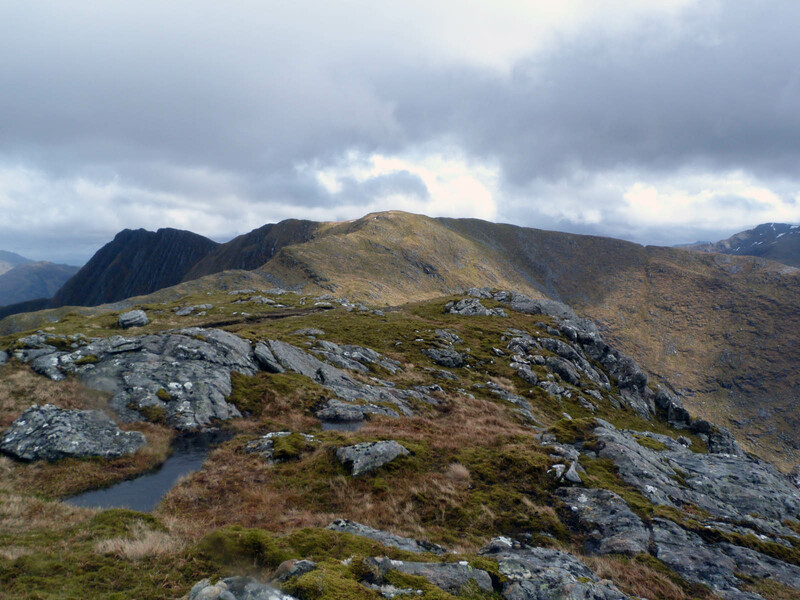 After much pondering I realised that the path that had lead me up here was a red-herring and I should have just continued along between the two ridges, shown by the green line which is steep but not nearly as steep as it might look. And my GPS had fooled me because although I was about 50 or 60ft above the path, I was only about 15ft away horizontally, and therefore it looked like I was more or less on it! Very annoying - beware clear tempting paths! 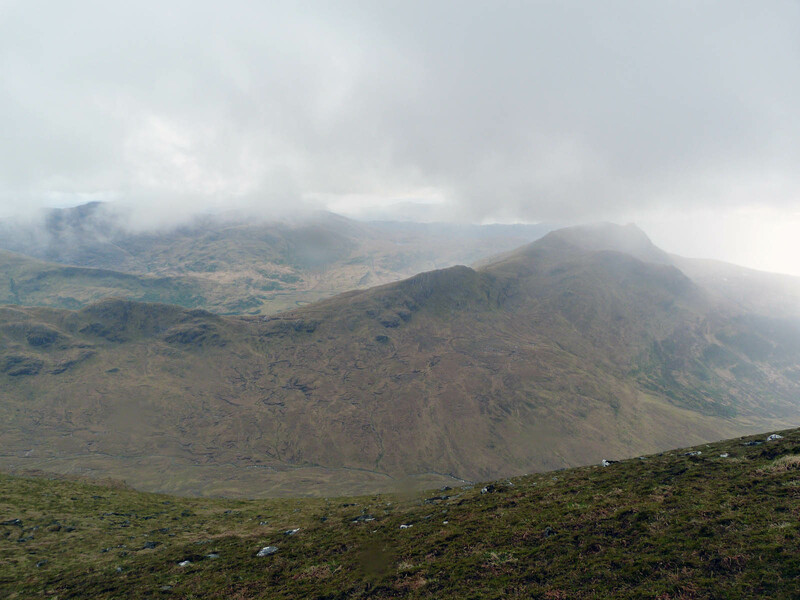 Just as I recovering from the shock and bother of straying off-route, and a considerable misty climb, the clouds cleared and I was presented with a view of what was to come - Ladhar Bheinn herself. And she looked enormous. I was convinced that there'd be no way I'd be able to get up it. The above photo isn't quite the same view. I seem to recall that at the time it loomed high into the sky above me, imposing, massive, dark and misty. I felt so small! 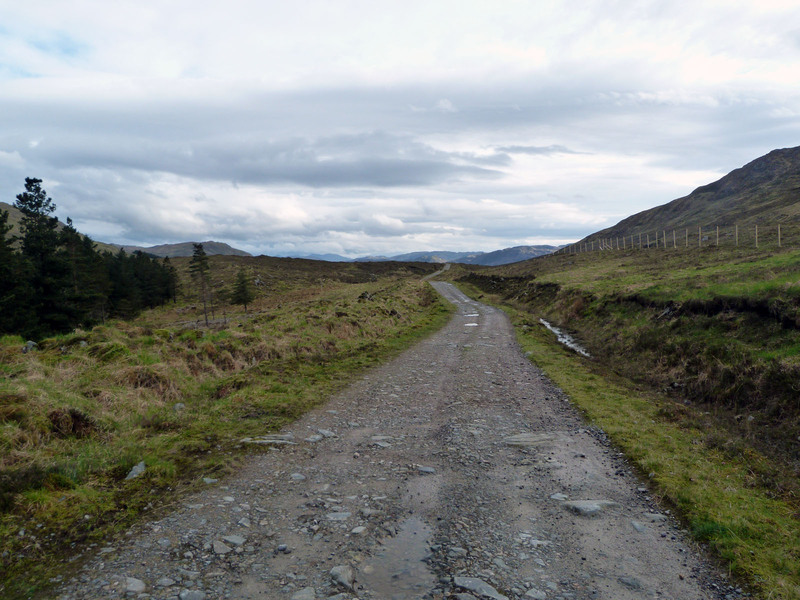 Although only 600ft or so higher than I was at the moment, there was still a bit of descent to go too. I really couldn't believe how big it looked! I'd been going 4½ hours by now and having seen the immediate future would've turned round and gone home - if there was any point. 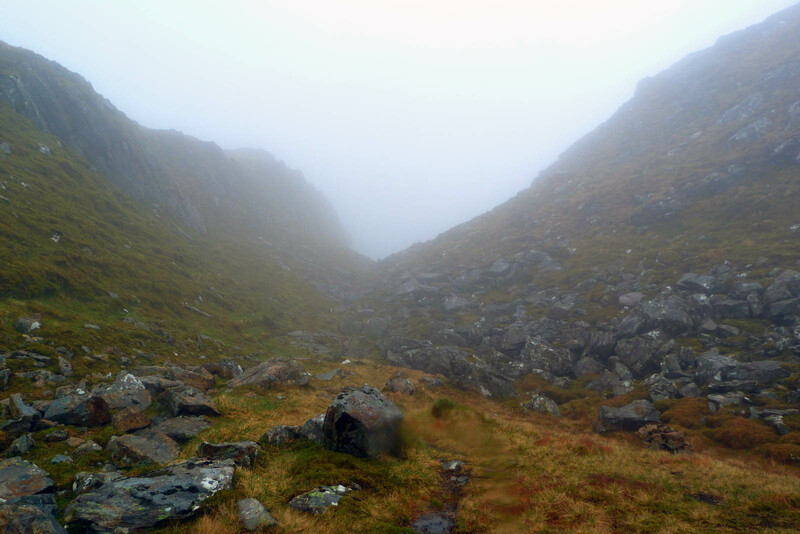 Dropping down into Bealach Coire Dhorrcail and the mist was still coming and going. But when it went the view of the next bit persuaded me to sit down for a bite to eat, it had gone 1pm by now so lunch-time it was. Except the last of my jam butties, designed to last a week, had suffered slightly by being in close proximity to the fire-lighters for a the last four days. Eugh! 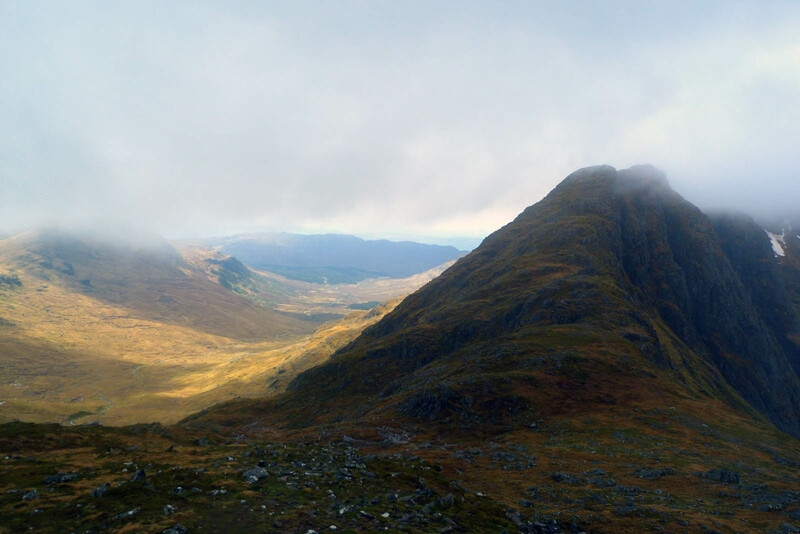 When the wind did take the mist away and the sun and blue skies broke through, the views down Coire Dhorrcail looking out towards Barrisdale Bay were lovely. 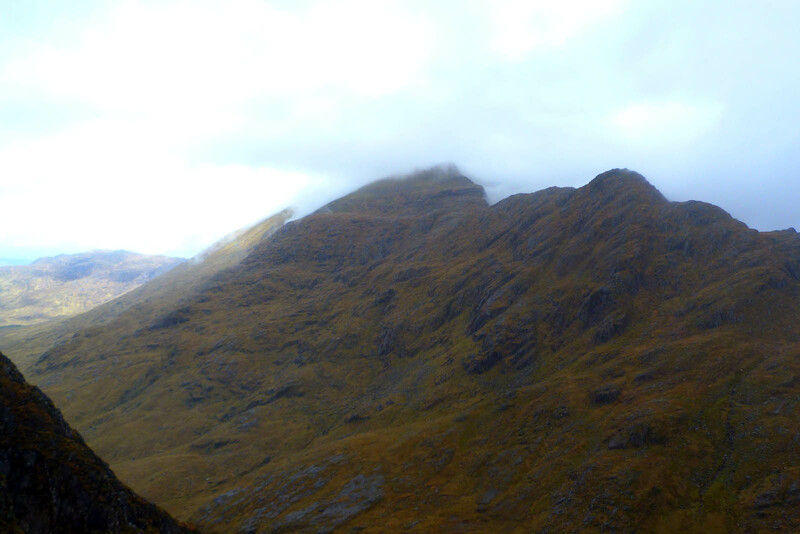 There was some serious scrambling and indeed some full-on clambering to be done to get up the other side of the bealach. 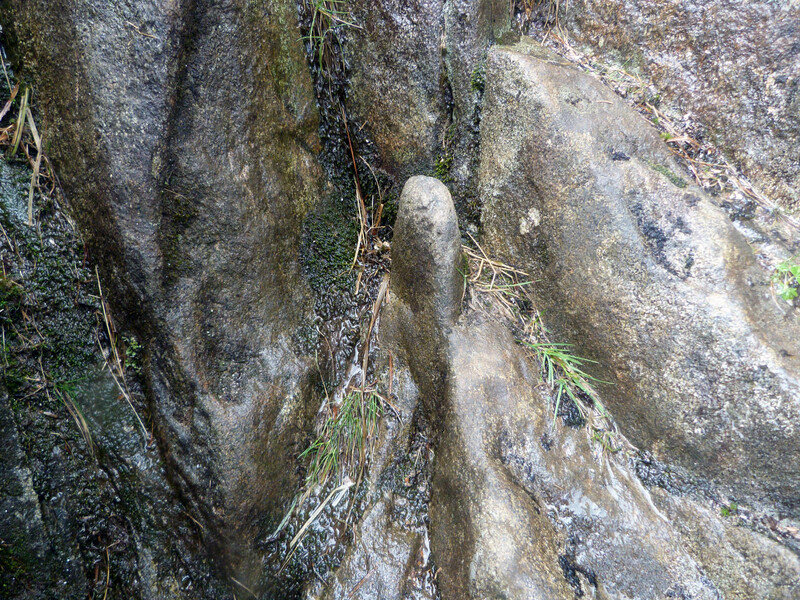 And this rather phallic looking rock-sausage came in very handy to hoist oneself up. I expect that every walker passing this way has had their hand gratefully grasped round this. Long may it stand proud! Looking back over Coire Torr as Asgaill, the valley far below, gave us a good view of the ridge we came along a couple of hours earlier - and acted as a reassuring progress report. But looking back is no good - we need to look forward! 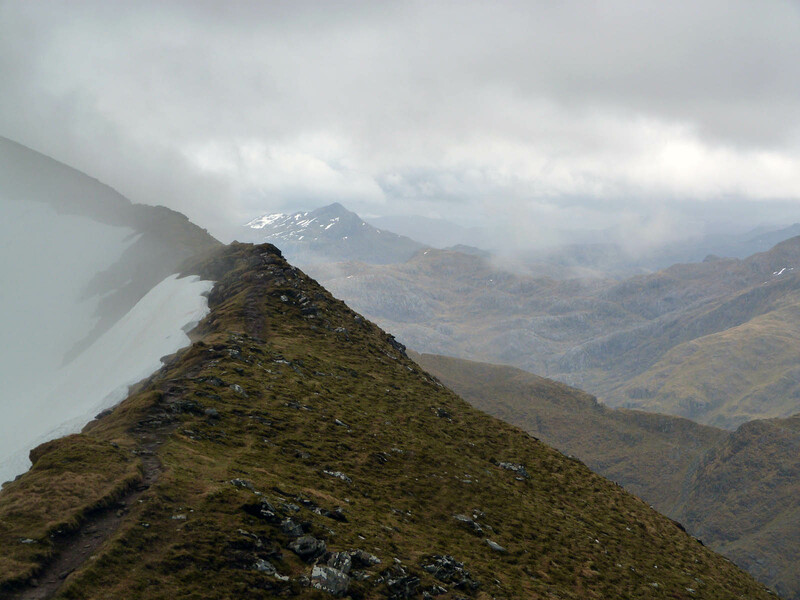 Still quite some way to go, and the long ridge stretching out ahead past Stob a' Choire Odhair looked both fun and daunting. 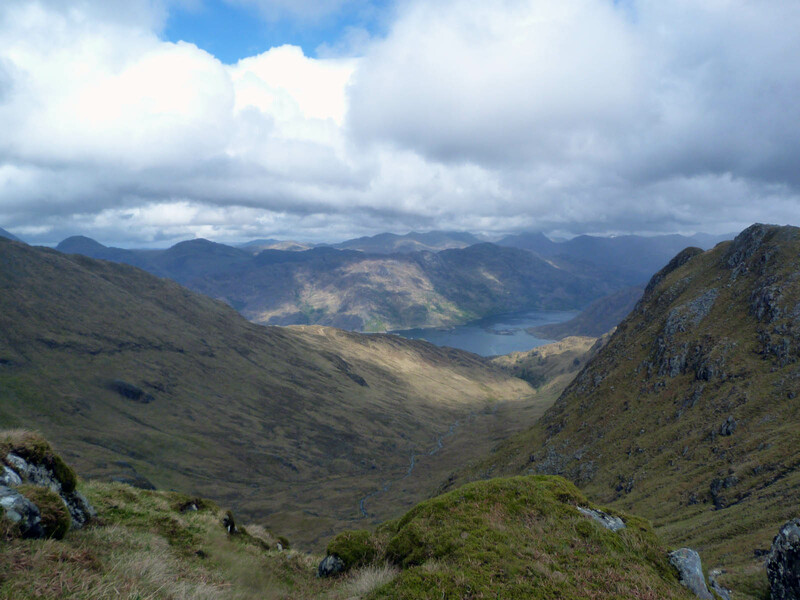 Just time for one more glimpse over Loch Hourn and Barrisdale Bay though. 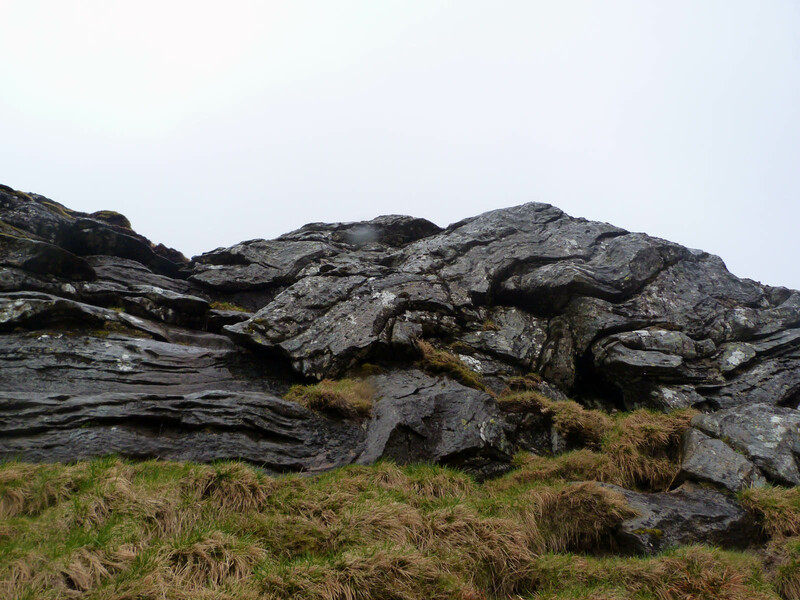 Perhaps the most daunting bit of all was this sheer lump of rock-strata as we got near the summit. The photo on the left is looking vertically up, and climbing up it was akin to climbing up a slippery stone ladder. 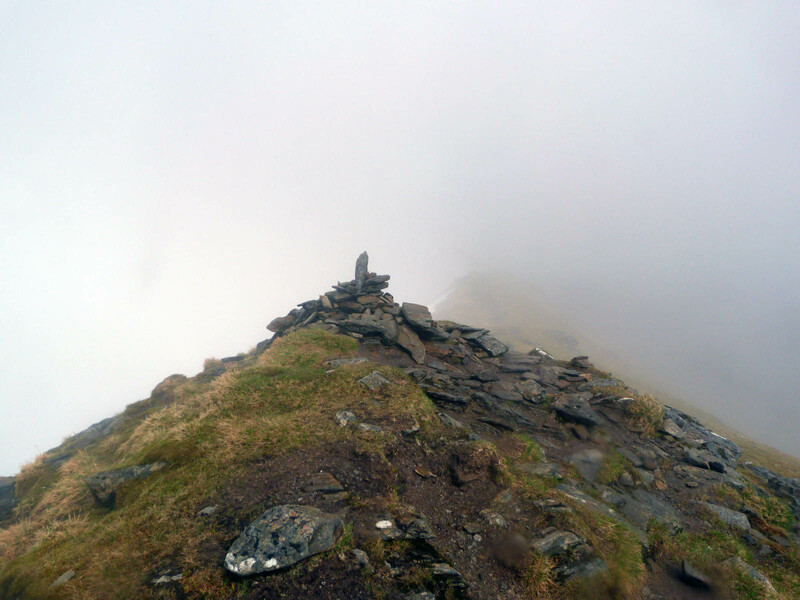 But it was worth it - just over the top was a cairn!! Hoorah! 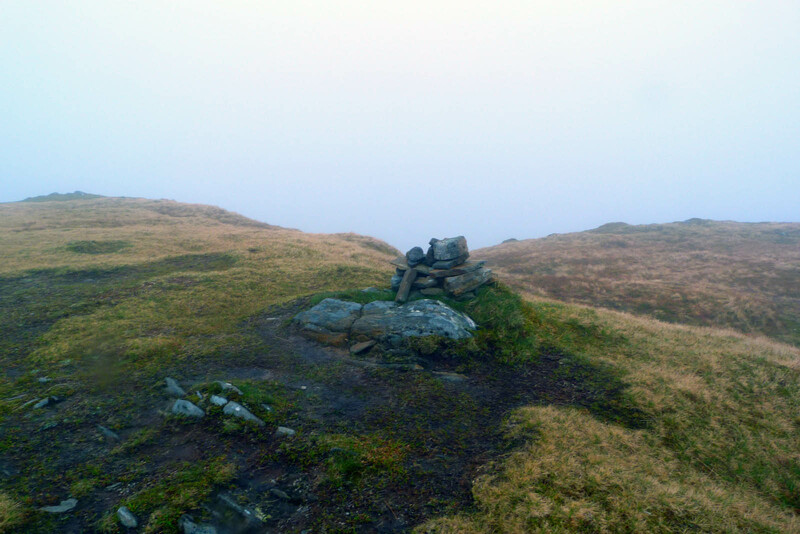 A cairn! We must be at the summit! Phew. Time for a couple of well-deserved selfies, and a moment to sit down and enjoy the view in between mists. Ahhhh. We made it! But wait .... what's this!!?? 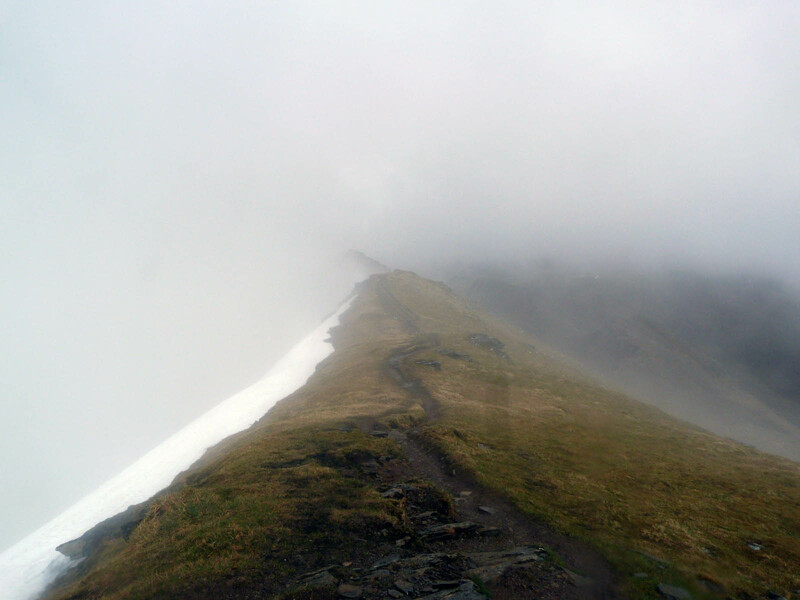 As the mist cleared, what appeared a little further on and a little higher up...? Another cairn?! What the heck??? 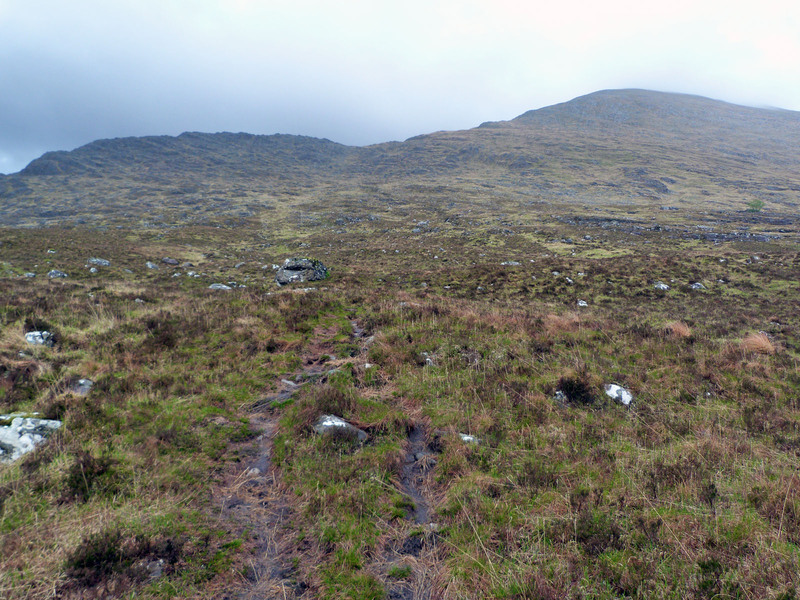 So on we trudge another quarter-mile or so along and another 100ft or so up to the real cairn. What a nasty trick to play on a hill-walker! 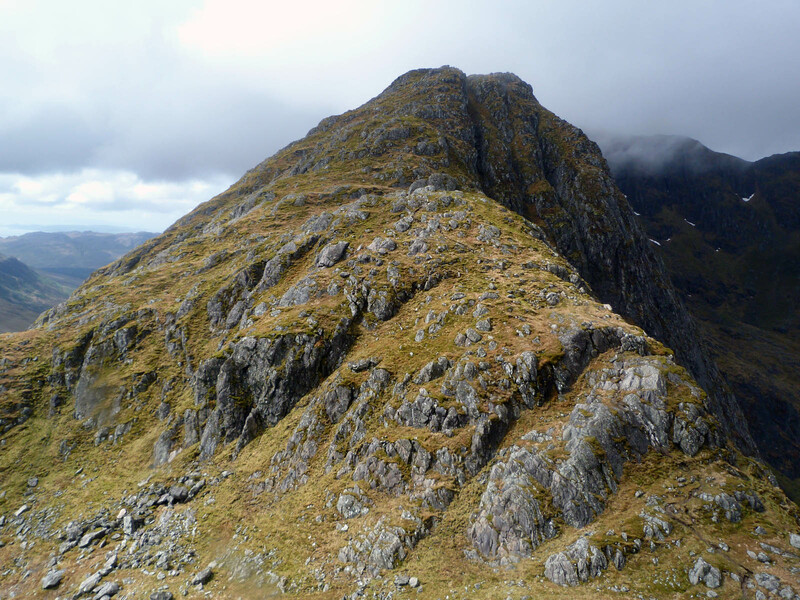 It turns out that pretty much every guide and write-up of Ladhar Bheinn mentions the 'false cairn', and I'd read a few so I'm not sure why I'd somehow missed this minor detail. Anyways, mission accomplished and time for the pub. It was 3pm, and there no time for faffing about for selfies here, especially as my arrival there was timed to meet with a wave of mist. 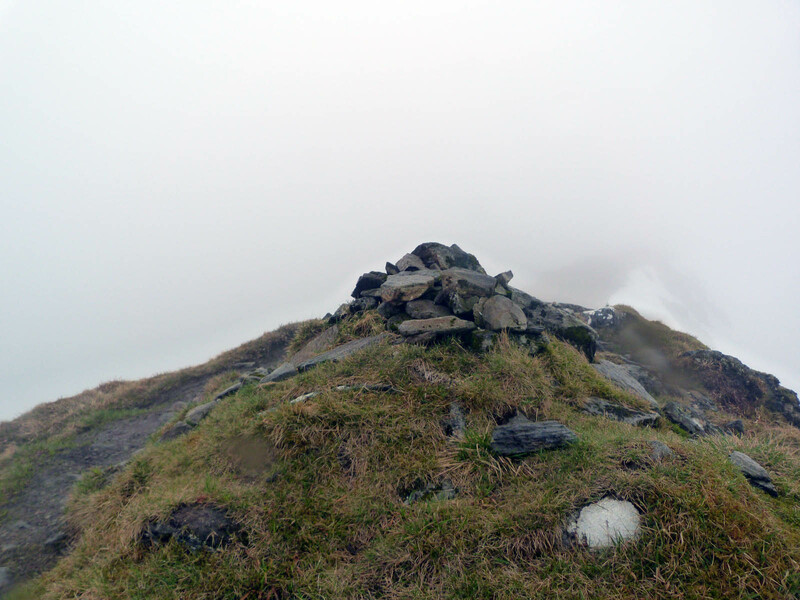 The stretch along the ridge towards the trig point was impressively ridgy - and relatively easy going. 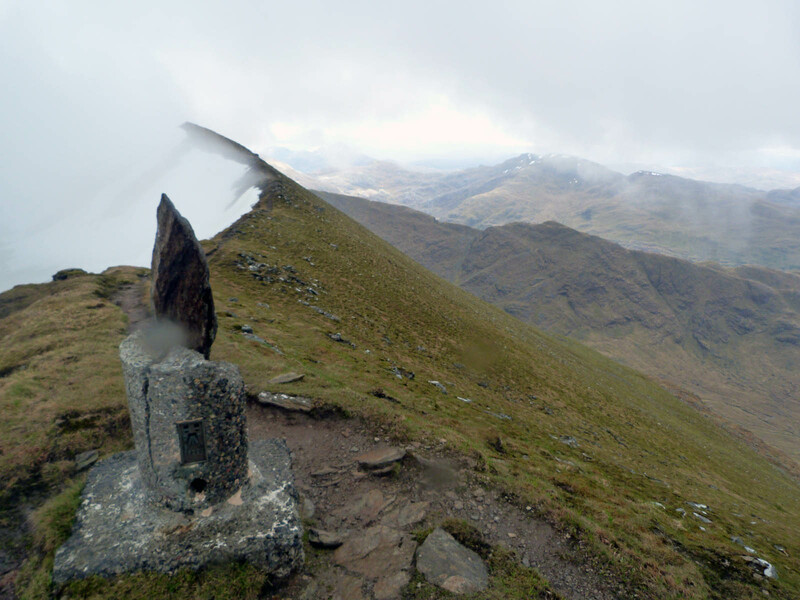 You feel a bit sorry for the trig point - shattered and not even at the summit. Time to head down now, and this is where it gets boring! It's a long way to go and going down is no fun, the wooded area above is what we were aiming for. 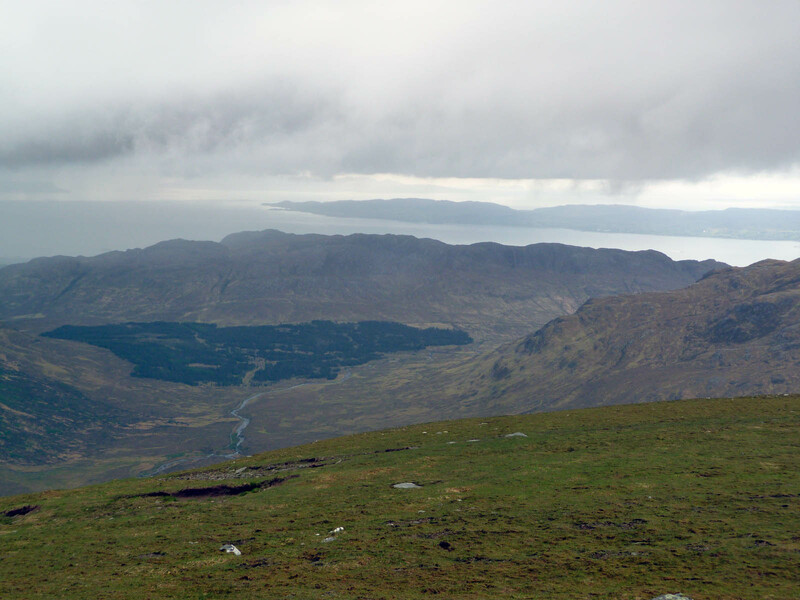 The rain looking out to sea didn't spoil the view of Eigg and Rum. And the sun picking out the woods we were heading for didn't make the current rough marshy steep-downhill grass seem any nicer. 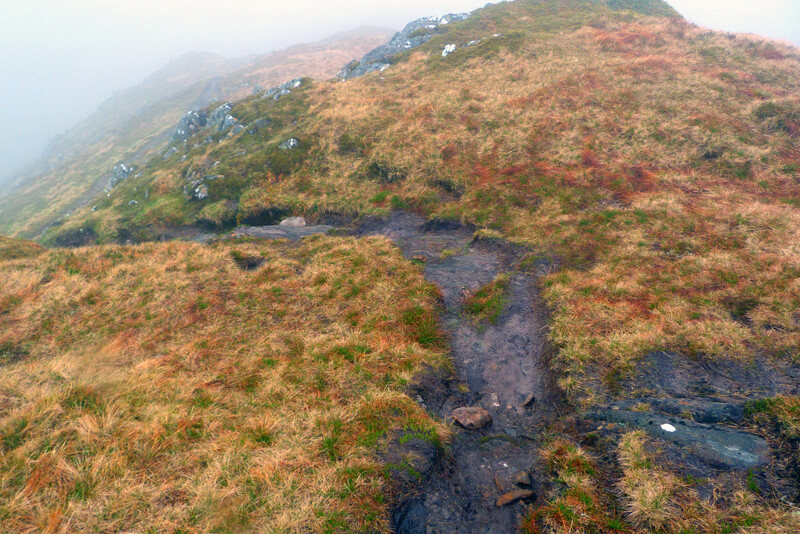 Very dull and both knees were not enjoying themselves any more than either of my wet feet. 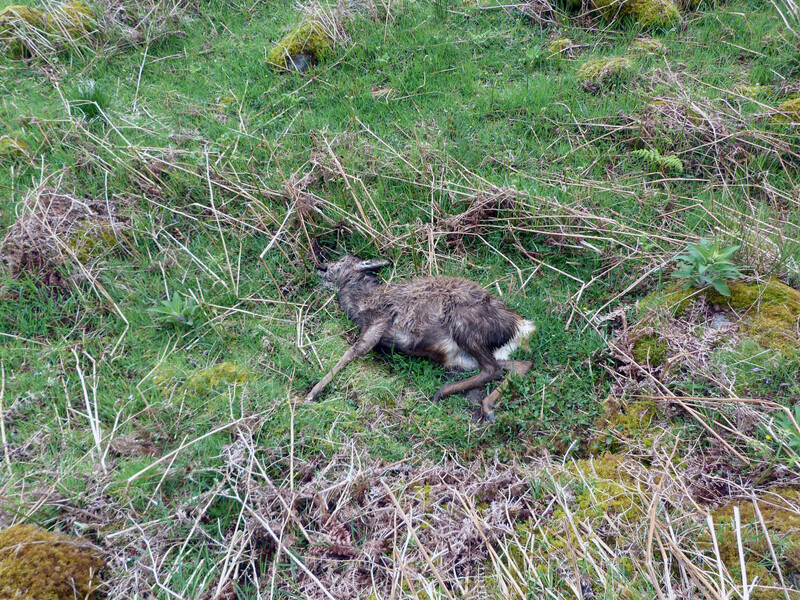 The ground was much like on the way up, except it wasn't as sunny, there were no dead deer (that I saw) and I could see where I had to aim for. From the trig point down to the bottom of the valley took the best part of an hour and a half, a vertical drop of some 2800ft in under two miles. Those ear-pops are reassurance that you're getting somewhere! Looking back up at the Ladhar Bheinn and the ridge it all looked pretty tame from down here, but no matter - I was just so happy to be back on a decent track. 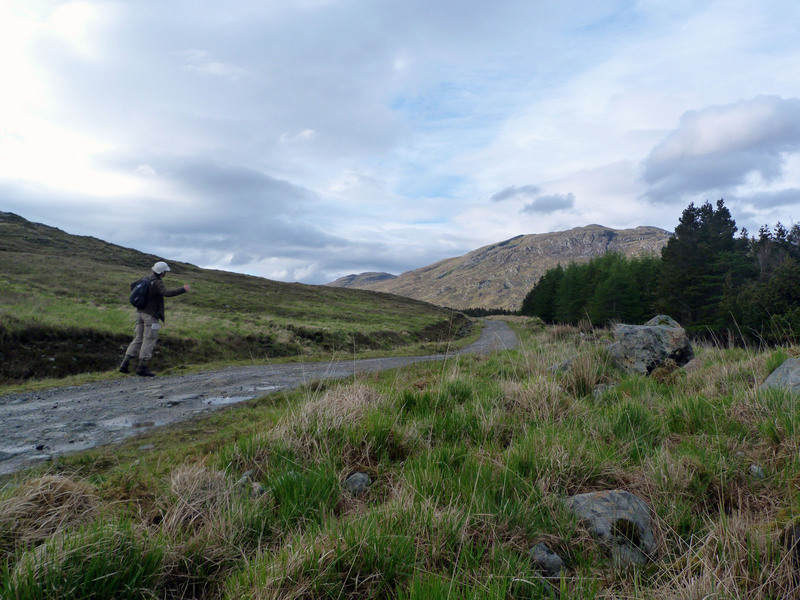 A quick change of socks and one last breather before leaving Gleann na Guiserein and entering the woods for the final triumphant march back into Inverie, and the pub. Woods that containing a log-bearing tree. Leaving the woods at Folach Gate - marked by the two boulders - there was little point in trying to hitch a lift back from the main road in to town. I'd just have to walk it. 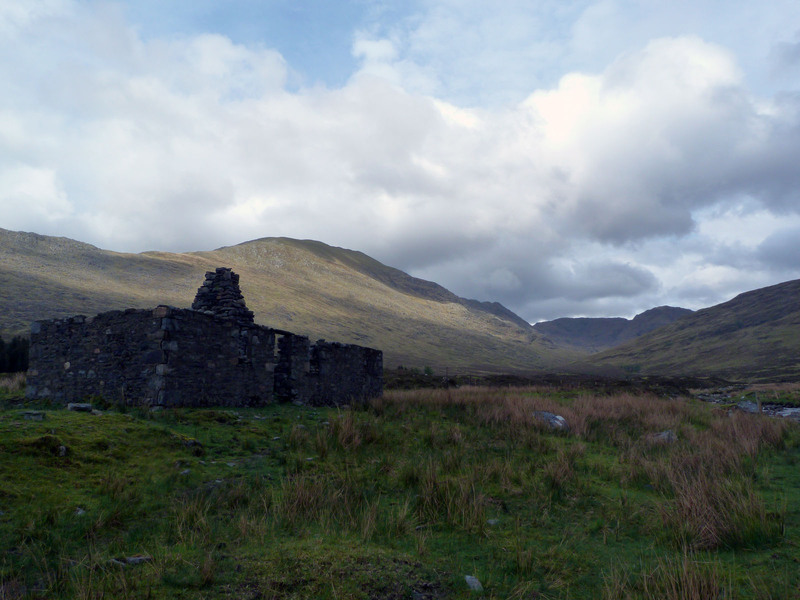 But the most pleasing view of all was Inverie again and the Old Forge in the evening sunshine. It was 7.30pm and my day had began at 8am - I was ready for boots-off and refreshments. 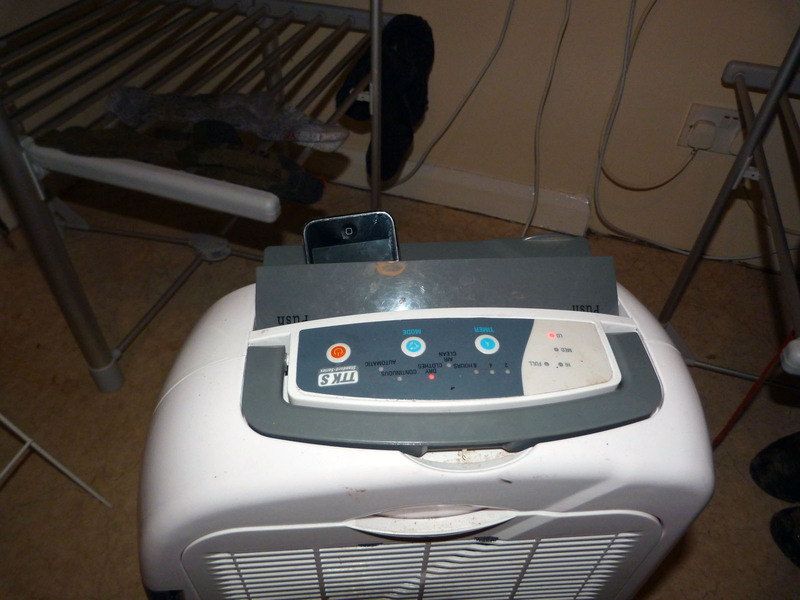 Finally after a hearty evening in the pub, back at the bunkhouse as I was arranging my damp hosiery in the drying room I noticed that someone else had rather greater ambitions than me for the abilities of the dehumidifier! Night night - my last night in Inverie. Last edited by Old Bill on Wed Aug 06, 2014 4:49 pm, edited 3 times in total. Enjoyed this report. 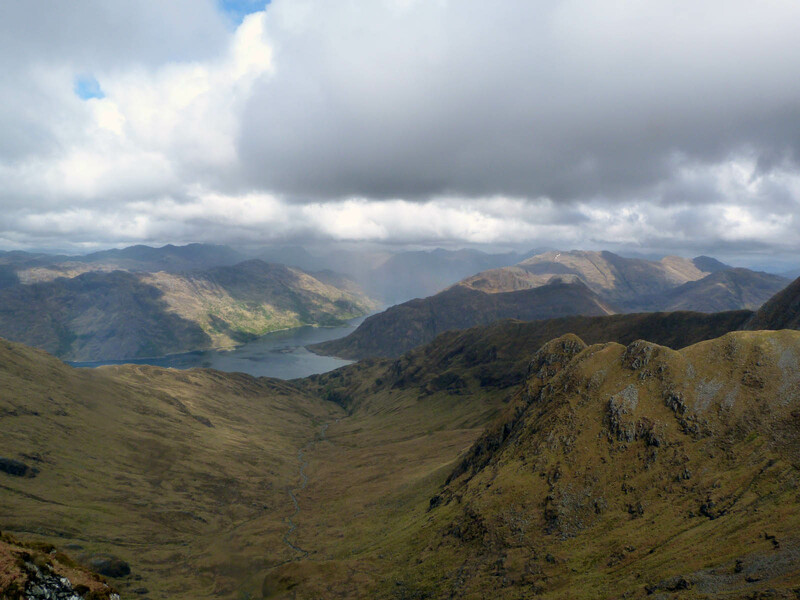 I envy you, but I hope to do Ladar B this year, but I really do want good weather: I've seen too many brilliant pix of Knoydart to be able to survive a day of clag!! Thanks Alte! 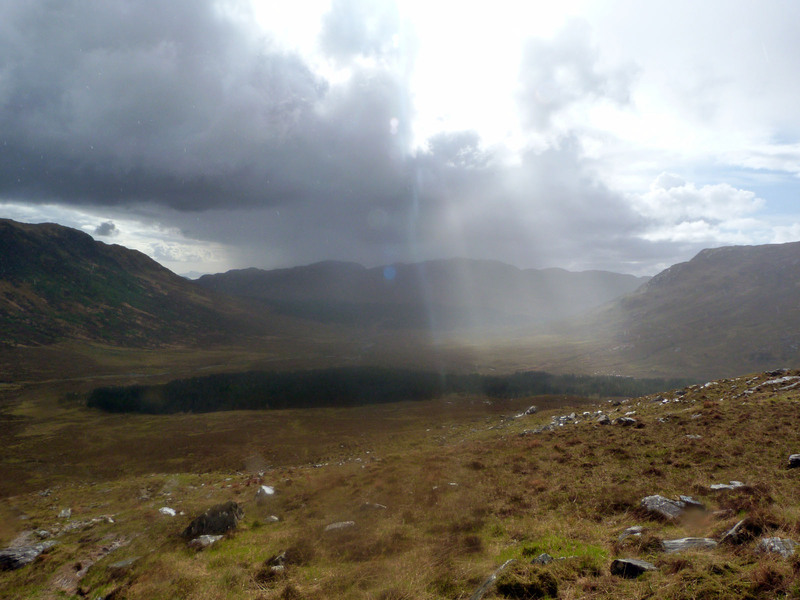 It's a great walk - but like everywhere the weather makes it. If you weren't for the breaks in the mist - which were plentiful - it would have been a pretty grim day! But it is grand up top. 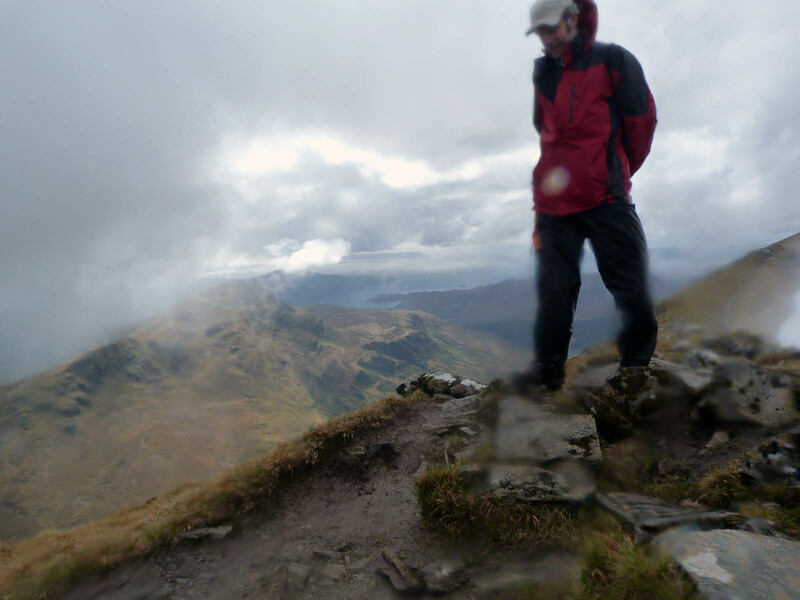 Also, the worst bit for me was going up towards Aonach Sgoite - very tedious. 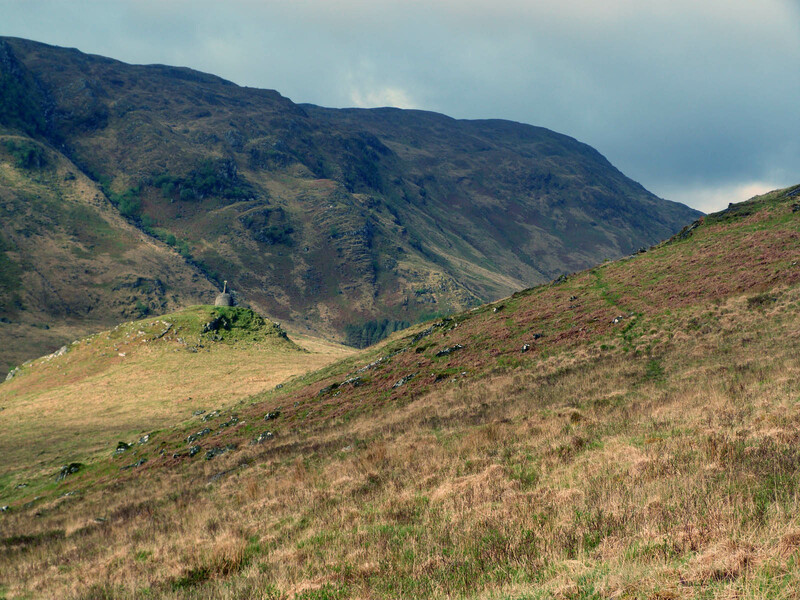 If you go that way the more direct path from further up the glen would be much better I think. 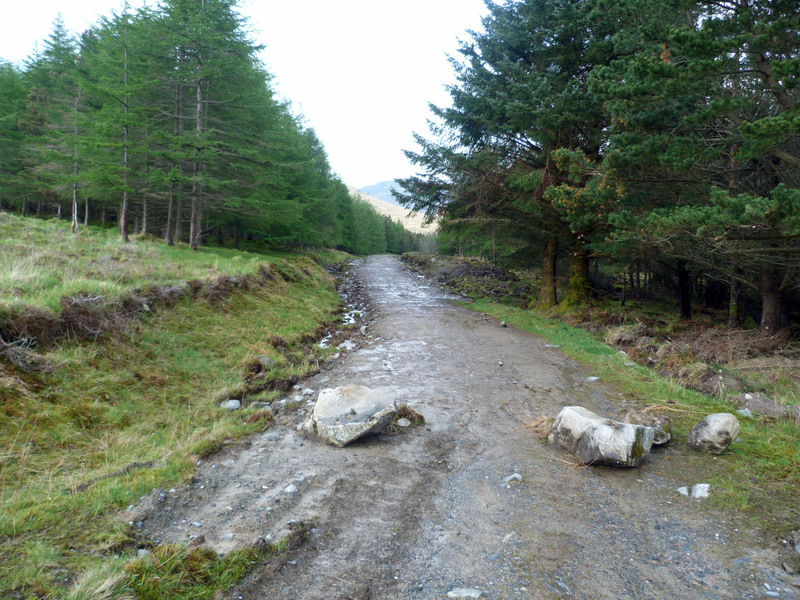 But there again there is the 'easy' way - up & down via Gleann na Guisserein, that's quite doable even in bad weather. Good luck - look forward to hearing about it! 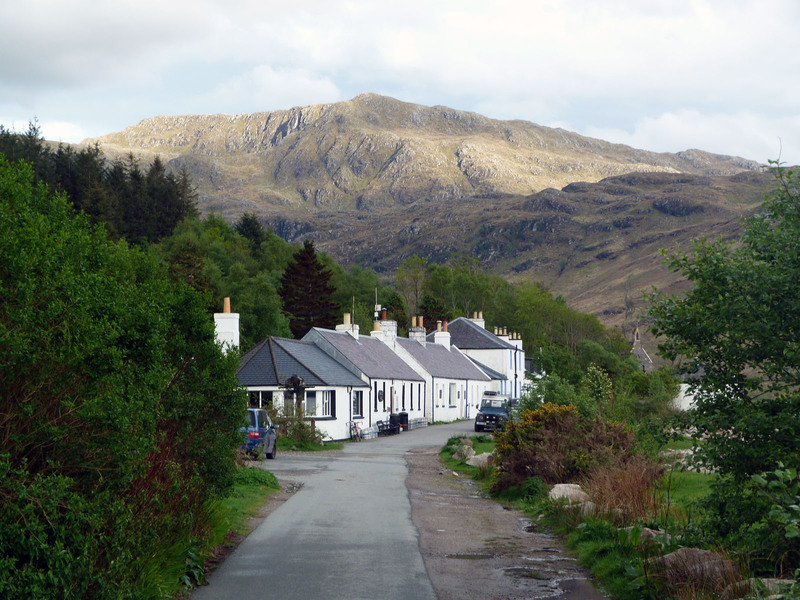 Loved your report and it will be of some use for my future venture to Knoydart. Nice report, Bill. You certainly had an interesting day. How does the price of a pint in The Old Forge compare with London? Great read and pictures. 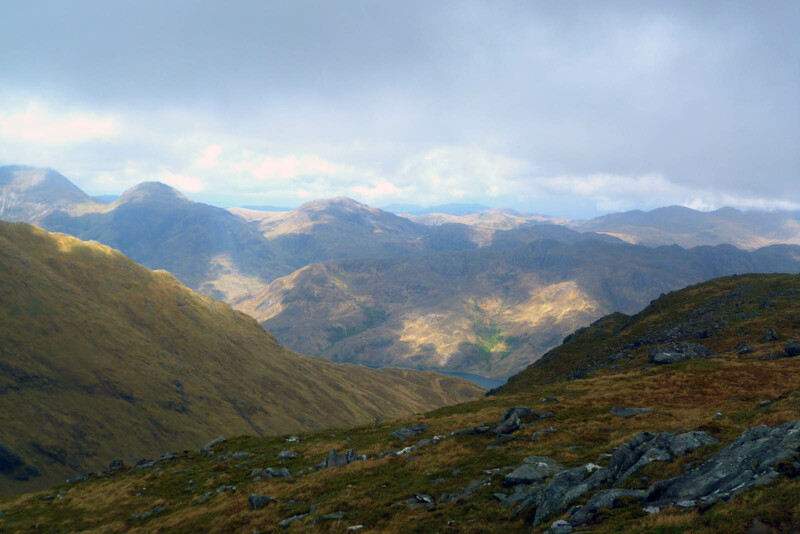 Looks like a fantastic hill and Knoydart is really special anyway. Hope to get there one day! I think your photo is indeed looking towards the Cuillin over the Sleat peninsula - may even be around Isleornsay. simon-b wrote: Nice report, Bill. You certainly had an interesting day. How does the price of a pint in The Old Forge compare with London? Not hugely different to be honest! But then I guess they've got a captive market there - but I still know where I'd rather be! 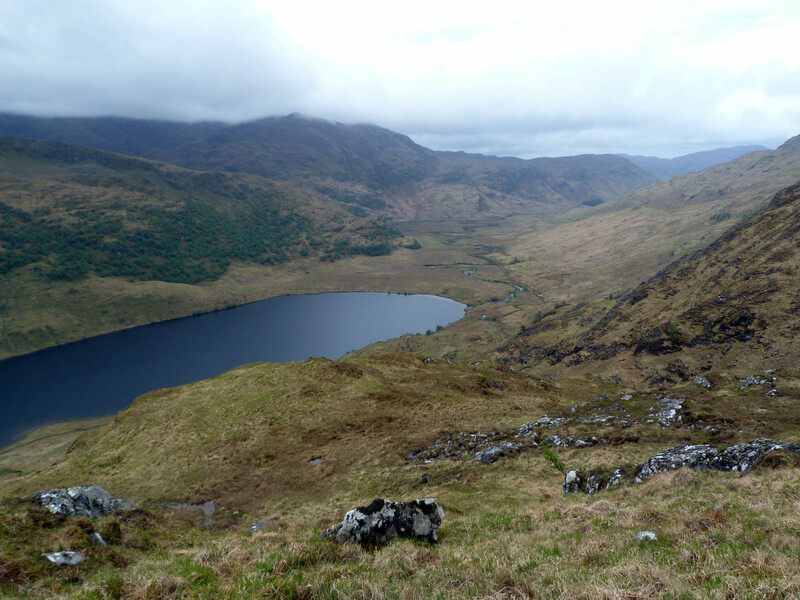 lochlaggan wrote: Loved your report and it will be of some use for my future venture to Knoydart. Cheers Grant - can't wait to get back there! Let me know how your trip goes. AnnieMacD wrote: Great read and pictures. 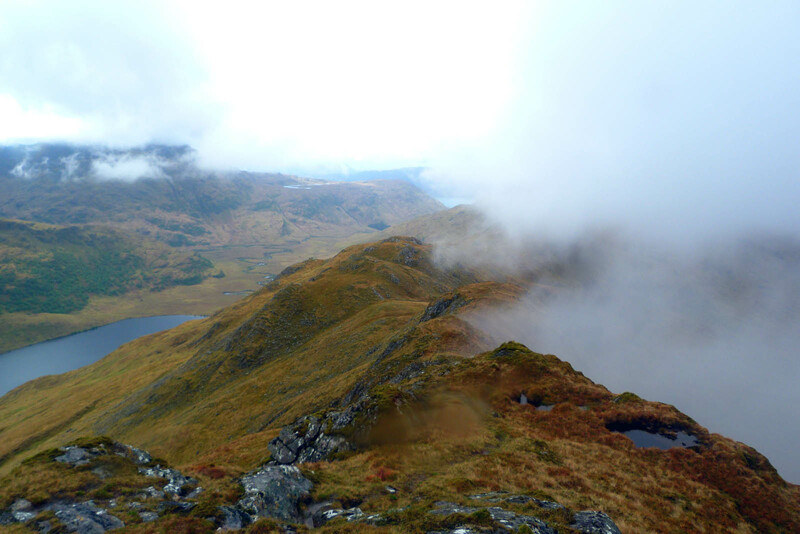 Looks like a fantastic hill and Knoydart is really special anyway. Hope to get there one day! 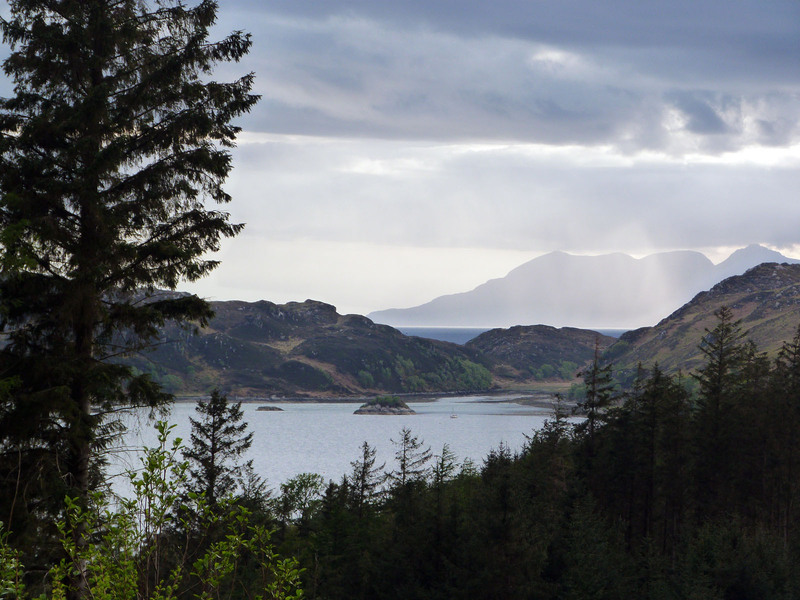 I think your photo is indeed looking towards the Cuillin over the Sleat peninsula - may even be around Isleornsay. Thanks AnnieMac! You're so right - such a special place! But thinking about it a bit more... 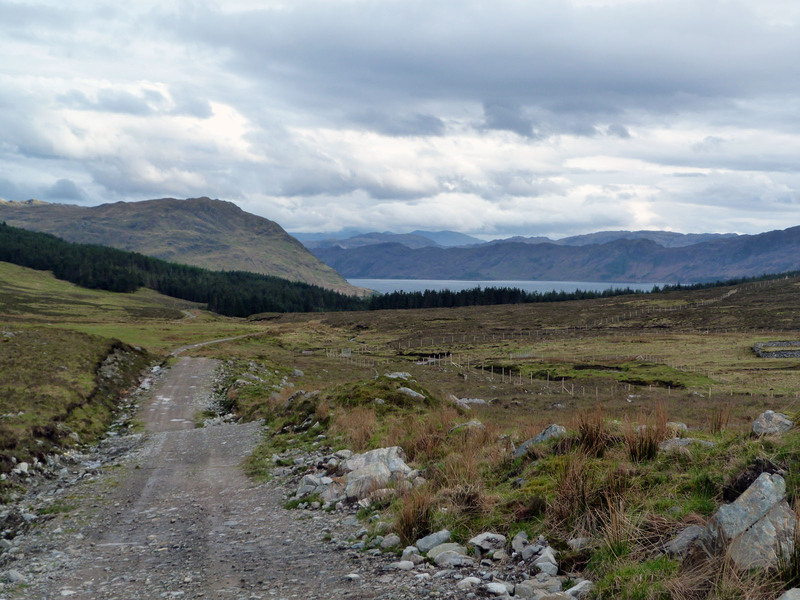 I think that the view is actually over Sandaig Bay and the hills in the distance are the southern tip of Sleat. The photo was taken from the red-circle area - what do you think...? 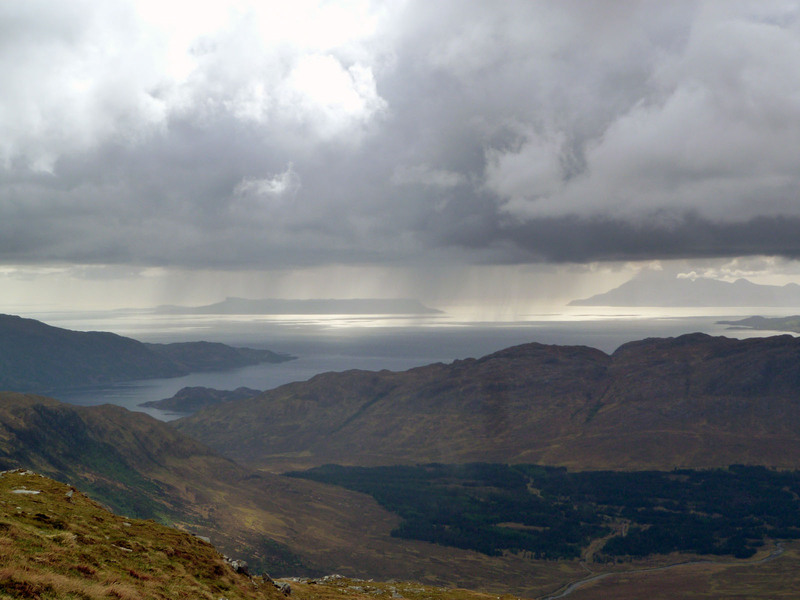 I do believe you are right in that it's Sandaig (Knoydart). 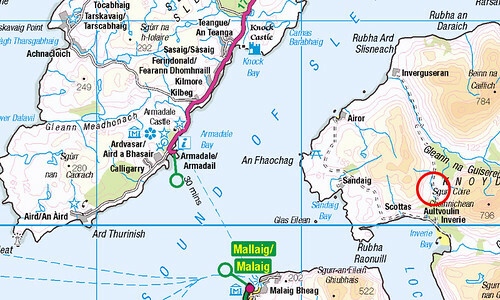 I had only heard of the 'other' Sandaig (near Glenelg) and I thought "Impossible" but then got the map out. I'm guessing that you were so far down that you can't see Sleat at all. I had a ruler and the maps out all over the floor trying to figure it out! It's a great photo too. Thankfully the gaps in the mist provided some great views when they felt like it and also served to hide what was to become too sometimes! Newbie here. Really enjoyed your report and especially the great photos.